Can Ritz crack the snack food market? Food manufacturer Mondelēz International is bringing Ritz Crackers back to television for first time in 30 years. In an attempt to make the brand relevant to younger consumers, the company announced recently a six week campaign to promote the launch of its Ritz Breaks snacks. Last year, the brand was re-introduced to new consumers through co-branded ventures with sister brand Cadbury. However, as can be seen when it is compared to a fellow snack brands McVities and Jaffa Cakes (owned by United Biscuits) there is much work to be done to gain a stronger foothold in the sector. As we can see from YouGov’s Buzz scores (which measures whether people have heard anything positive or negative about a brand in the past two weeks) for all three brands, the two United Biscuit brands, McVities and Jaffa Cakes, have out-performed Ritz by a fair margin. 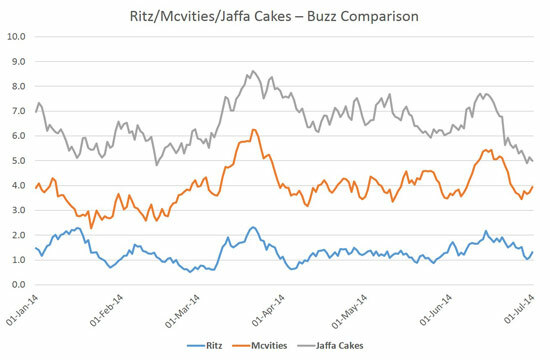 Since January 1st, Ritz’s average Buzz score is +1.3, while McVities is on +3.2 and Jaffa Cakes +6.5. The importance of a strong advertising strategy to the sector is underlined when we look at the effectiveness of campaigns launched for the United Biscuits brands in February to promote its Digestive and Jaffa Cake ranges. We can see how successful they were using our Ad Awareness metric, which asks whether people have seen or heard a brand’s advert. 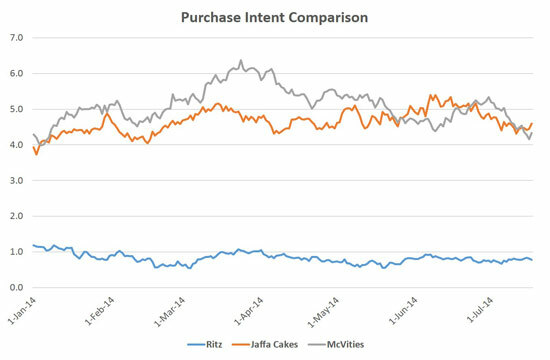 From its launch in early February the score for Jaffa Cakes rose from +2.0 to +7.5, and there was a similar story for McVities, which increased from +3.1 to a high of +7.4. Meanwhile, without a prominent campaign during this time, Ritz had an average score of +1.1. So what does this mean in sales terms? Well we can look at the BrandIndex Purchase Intent metric. Again we see the two United Biscuits brands exceeding the level achieved by Ritz. 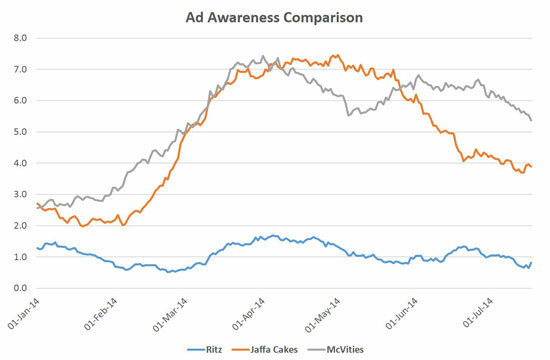 Since early February, Jaffa Cakes has an average of +4.7 and McVities scores +5.2, while Ritz lags behind on +0.8. In order to earn some of the share United Biscuits has in the sector, Ritz’s new campaign will have to be mightily successful. The return to TV should help boost its profile but we will have to see whether this leads to increased sales.